In any workplace, washrooms are one of the most used facilities and as such they should be providing a clean and hygienic environment to minimise the risk of staff or visitor exposure to bacteria and other infectious microorganisms. Improving the washroom hygiene standards in your premises not only shows your business’s regard for the health and safety of your employees and visitors, but can have an effect on your business’s productivity and profitability. At Corporate Clean Property Services we have over 20 years’ experience in providing washroom services. We’re committed to keeping you healthy by providing high quality hygiene solutions that minimise the risk of infection, whilst helping to reduce your water usage, electricity and cleaning costs. Corporate Clean Property Services provides specialist training to its staff on products and processes to ensure that infection control is targeted. All our cleaners are background checked, dedicated, reliable, and work from detailed check lists. To complement our range of solutions we also offer a comprehensive array of bathroom products and refills including soap and dispensers, hand systems (paper or air), urinal sanitisers, seat cleaners, feminine hygiene units, and automated air fresheners. Corporate Clean Property Services offers a wide range of comprehensive and customised hygiene and washroom cleaning and service solutions to ensure that you are providing and maintaining a clean and hygienic washroom environment. 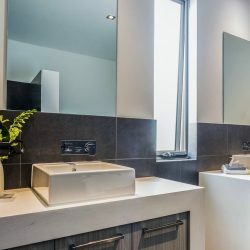 The wide range of washroom services and products we offer suits all types of organisations and washrooms, large or small, with premises open or closed to the public. Our solutions include urinal/toilet and surface cleaning programs to ensure your washroom is fresh, clean, germ-free and smelling great for the enjoyment and comfort of your employees and visitors. Toilets and urinals are deeply cleaned on a regular basis to prevent uric acid build up (and the resultant unpleasant odours which commonly occur) and attention is paid in particular to “touch zone hotspots” where bacteria breed and can be transmitted, such as dispensers, faucets, handles, doorknobs, push plates, etc. We use eco-friendly, high-grade disinfectants that provide a comprehensive kill spectrum with minimum volume usage, and we ensure that all waste is treated and disposed of in an environmentally responsible manner.